Ivarstead is a small milling town located at the eastern base of the Throat of the World, on the western edge of the Rift and the western shore of Lake Geir. 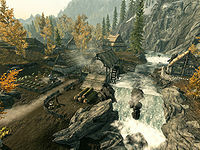 Pilgrims and travelers often pass through, as the town is located at the beginning of the 7,000 Steps to High Hrothgar. It used to be a good-sized town, but in recent years, many townspeople have been leaving for Riften, and business in the town has been suffering. Ivarstead is next to a barrow which many believe to be haunted. It was in a field by this town during the reign of High King Harald that Archmage Geirmund dueled the criminal Sigdis Gauldurson. Both were slain, and both were interred on a small island on Lake Geir, east of the town.